PLANT NAME: Mimosa pudica L.
COMMON NAMES: Hilahila (“shy”) [Hawai’i]; sensitive plant, sleeping grass [English]; han xiu cao [China]; betguen sosa [Guam]; chami [Peru]; cogadrogadro [Fiji]; lajjalu [India]; lajwania [Indo-Fijiian]; mechiuaiu [Palau]; ra kau pikikaa [Cook Islands]; sulinit [Borneo]; tchua tchu zaw [Hmong – Laos]. CATEGORY: Herbs that calm the spirit. PROPERTIES: Sweet astringent, slightly cold. TOXICITY: There is some chronic toxicity. The dried plant is reportedly toxic to cattle. CAUTIONS AND CONTRAINDICATIONS: Use only under professional supervision and not for extended periods of time. Not in pregnancy. Mimosa pudica thorns can harbor the fungus Fonsecaea pedrosoi, a cause of chromoblastomycosis. Not that you would, but, don’t walk barefoot on hilahila. DOSAGE: 10 – 15 grams in formula, up to 25 grams if used alone. STATUS IN HAWAI’I: Alien. High pest factor. Get rid of it! The sharp thorns make short work of unprotected feet. Wear gloves when gathering. WESTERN FUNCTIONS REPORTED: Anthelminthic; antibacterial; antibiotic; antihyperglycemic; anti-implantation; anti-inflammatory [China]; antimicrobial; anti-pyretic [China]; anti-spasmodic; antitussive [China]; antiviral; bactericide [Trinidad]; calmative [Panama]; contraceptive [India]; depilatory; diuretic [China]; emetic [Haiti, Panama, Southeast Asia, Venezuela]; expectorant [China]; poison; sedative [China, Guatemala, Java]; tonic [Costa Rica, Dominican Republic, Venezuela]; tranquilizing [China]. TRADITIONAL CHINESE ENERGETIC FUNCTIONS: Dispel pain and remove swelling [Taiwan]. Dysentery, bloody dysentery (leaves ground, internal) [Haiti, India, Indo-Fijiian]; diarrhea [India]; enteritis, gastritis [China]. Hemorrhoids [Fiji (leaves in combination), India, Indo-Fijiian]. Hoarseness [Haiti]; throat diseases (seeds) [Southeast Asia]; sore throat [Brazil (decoction gargled)]. Toothache [India (root fried in ghee, topical)]. Fever [Borneo (root), Cuba (root decocted), India, Indo-Fijiian]. Rheumatism [Brazil (root decocted); rheumatoid arthritis India (root decocted)]. Skin wounds [India]; swelling [Brazil (root decocted), Java]; trauma (mashed topical). High fever in children [China]. Whooping cough (leaves fried, internal with honey) [India]. 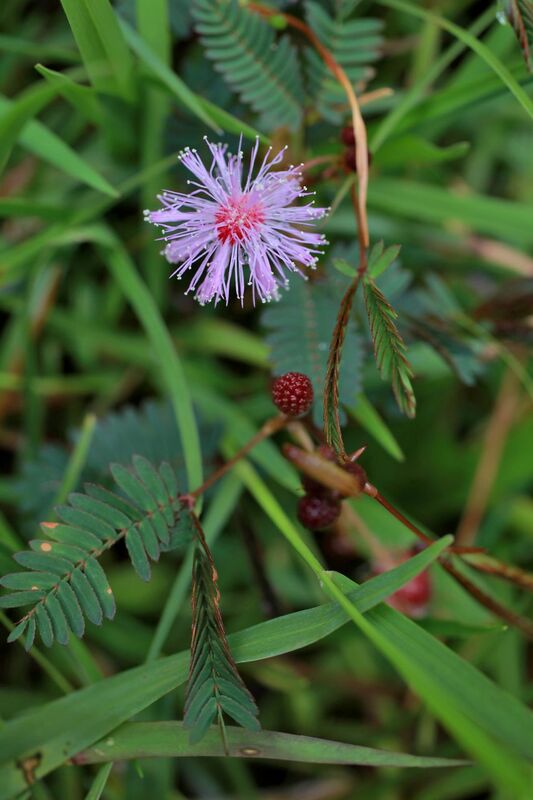 In the Afro-Brazillian religion Candomblé, Mimosa pudica is associated with the god Exu. Hysteria (root tied around the neck to remove evil spirits) [India]; insomnia [China, Indo-Fijiian, Java (placed under pillow), Panama, Peru, Trinidad]; irritability, “neurasthenia” [China]; nervousness [Indo-Fijiian]; depression [Mexico (dried leaves infused)]. To facilitate childbirth [Carribean]; labour pain [India]. Excess menstrual bleeding [India]; menstrual difficulties [South East Asia]. Aphrodesiac [Bolivia (seeds), Hawai’i (root infused in oil, topical). Unwanted pregnancy [Cuba (root decocted)]. Asthma [Costa Rica, Southeast Asia]; bronchitis, lung infections with fever [China]; cough [Borneo (root)]; pulmonary hemorrhage [Bolivia]. Urinary inflammation [Nepal]; kidney inflammation [West Indes]; reduced or burning urination [Trinidad]; bladder infections [Fiji (leaves / roots in combination)]. Eaten by elephants in the wild, apparently for digestive problems and possibly for gastrointestinal parasites. CONSTITUENTS: Ascorbic-acid, crocetin, crocetin-dimethyl-ether, d-glucuronic-acid, d-panitol d-xylose, gentisic acid, jasmonic acid, linoleic-acid, linolenic-acid, mimosine, mucilage, norepinephrine, oleic-acid, palmitic-acid, sitosterol, stearic-acid. Urinary stones: Add Kyllinga spp. (kili’o’opu) and Commelina spp. (honohono). Agitation: Add Vernonia cinerea (yi chi xiang), Oxalis spp. (‘ihi), Verbena littoralis (ha’uoi), and Pipturus albidus (mämaki). Insomnia: Add Piper methysticum (‘awa). Snakebite: Root internal with three leaves of Azadirachta indica. Diabetes: Whole plant with rice [India]. Temporary birth control: Roots with Piper nigrum (bi ba / black pepper), Cissampelos pareira, and Hibiscus rosa-sinensis (aloalo) [India]. Permanent sterilazation: With Bambusa rundinacea, Heliotropium indicum, Hibiscus rosa-sinensis, Plumbago zeylanica, Plumeria rubra, and Salmalia malabrica. RANGE: Throughout the Pacific, India, Indonesia, Southeast Asia, China, North and South America. Probably native to South America. HABITAT: Full sun, well-drained soil, disturbed areas, and lawns. Anywhere people walk barefoot. GATHERING: Gloves, summer and autumn. PROPAGATION & CULTIVATION: From seed or cuttings. (Don’t propagate in Hawai’i!) Does not like over watering or root disturbance. Water extract reduces myotoxicity of Naja kaouthia (cobra) venom [Mahanta 2001]. May stimulate nerve regeneration in lab animals [Prasad 1975]. Showed no significant reduction of urinary stones in rats [Joyamma 1990]. scabrella and M. tenuiflora contain tryptamines in the roots. It is unclear if M. pudica does. This beautiful and aggravating garden pest seems to find its way into most Hawaiian yards at one time or another. Its most interesting characteristic is the way the leaves fold shut when touched. “The proprietor of a bar in our town keeps a sensitive plant (Mimosa pudica) on his premises. When this plant is touched, the leaves fold and the stems droop. Recovery is prompt, and the action can be repeated endlessly without harm to the plant. When the bartender feels a customer has had too much to drink, he gives him an “alcohol-sensitive test” by having him touch the plant. He warns that if the plant wilts when it is touched, the drinker should not drive. The inebriated patron is usually so startled by the plant’s action that he willingly calls a cab.” – – Mary Shier, President, Anchorage Chapter Alaska Master Gardener. Prasad GC, Khanna RP, et al. 1975. 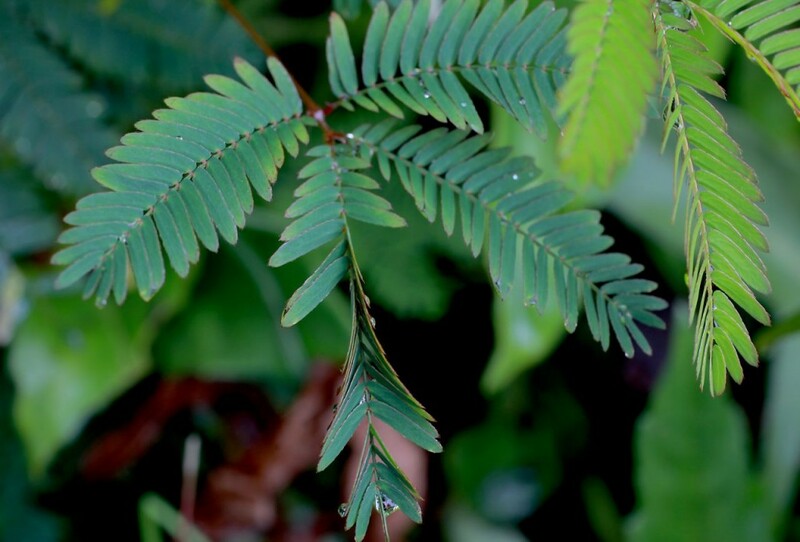 Effect of Lajjawanti (Mimosa Pudica) on Regeneration of Nerve. Jur. Res. Ind. Med.10: 4, pp.37-44.